The Dragon Ball FighterZ World Tour finals brought together some of the best players in the world to duke it out and it was nothing short of heart stopping action. 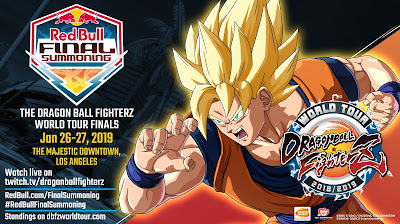 Congratulations to Kazunoko who kept his cool in a heated grand finals as the MVP of the tournament Fenritti battled his way from the very bottom to make it to the final stage. The finals were so close to the point that the game was reset, however when it came down to it, Kazunoko was able to edge it out. Now a lot of individuals were expecting an announcement in regards to the next season of Dragon Ball FighterZ and they of course were not wrong, however what they didn't expect was to get a trailer for the upcoming Dragon Ball RPG titled, Dragon Ball Game Project Z. The trailer took us through some of the highlights from the series, but nothing yet in terms of actual gameplay other than a short clip of Goku walking around familiar locations. Could this be a hint that the game will be open world? We can only hope. Following this we were given a glimpse into the future of Dragon Ball FighterZ with some new character announcements. Season 2 officially kicks of on January 31st with the addition of Jiren and Videl to the roster. Jiren has been long rumoured, however it was nice to see a change up with the inclusion of Videl, but what really intrigued me were her combinations with Gohan as it seems she works a lot like Android 18. We also got a glimpse of two characters that will be added later down the line, that is Dragon Ball Super Broly and SSGSS Gogeta. This is definitely in response to the recent film and it will be interesting to see how they play. The game already includes multiple Goku's, so why not another broly eh? We can expect six new characters this season and based on what we already know, that leaves two more to be revealed. If I was to speculate I would like to think that Master Roshi would be coming up only because we have all the characters that participated for universe 7 in the Tournament of Power except him. Only time will tell. The event ended with an announcement of a new world tour for 2019. Details of this will be released soon, however its safe to say that after the previous scare not too long ago in regards to its future, Dragon Ball FighterZ is set to have a healthy life span and quite frankly, beyond that the actual franchise remains strong in its popularity.